Because they are part of our family. They not only provide us with milk, but give us unconditional love and affection just like your average family dog. Every animal has a name and they know it. If you visit the farm and ask any of the family members (human) what the goats names are, we can rattle them off and hear all the different goat voices answer back! We milk the goats seasonally to give them a break during the winter while they get ready to have new “kids” in the late winter early spring. As the kids are born we will update the web page with photos so check back to see what kids we have available. 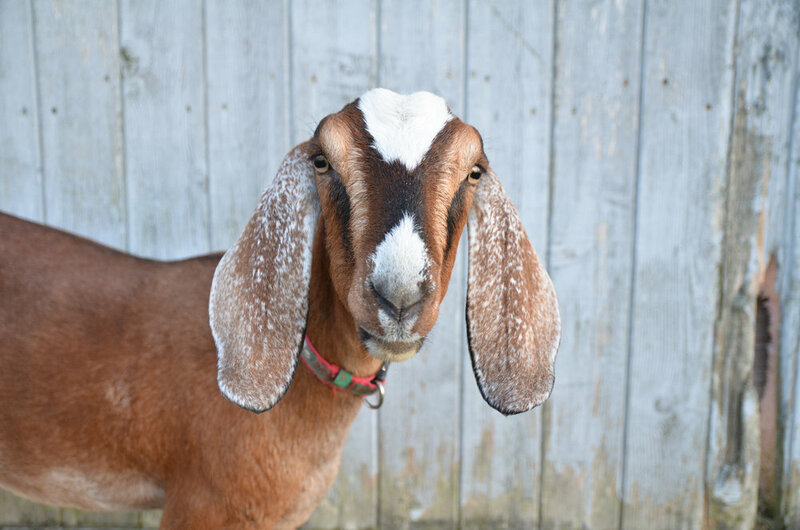 Meet “Scout,” one of the first Nubian goats to come to our farm. She is very verbal and does not like change! It is not true that goats will eat anything, but they are very curious and are always watching…. “Snowball,” a.k.a. “Screwball,” is one of our crazy white goats. We purchased her from a farmer down the road after she was caught climbing on their truck! She is a bit crazy, but we love her. “Kiwi” and “Oreo” peeking out of the barn to see whats going on. “Emma” has a dear spot in Amy’s heart. She was one of the first to join the farm but went to live with a new local family to pursue her 4H showing career. “Rosie” is always smiling for the camera! Animal photography courtesy of Amy Thomas Oswalt Photography and Whalen Photography.